“I couldn’t help but admire your large triangular prism,” I wrote. Sadly, this is not the strangest way I have begun an email to a colleague. “Are you talking about the giant Toblerone-shaped thing? You math guys are weird,” she replied. About how many regular size Toblerone chocolate bars fit inside the giant Toblerone-shaped thing? Give an answer that’s too big. Give an answer that’s too small. 63. Relax. The video is coming soon. If 72 regular size Toblerone chocolate bars fit inside a mega Toblerone-shaped thing, how large would it be? If 112 regular size Toblerone chocolate bars fit inside a mega Toblerone-shaped thing, how large would it be? A mega Toblerone-shaped thing is a little bigger than a giant Toblerone-shaped thing. What could its dimensions be? How many regular size Toblerone chocolate bars would fit inside? I like the phrase “a little bigger.” Probably “borrowed” from Marian Small. The ambiguity here allows for multiple solutions. 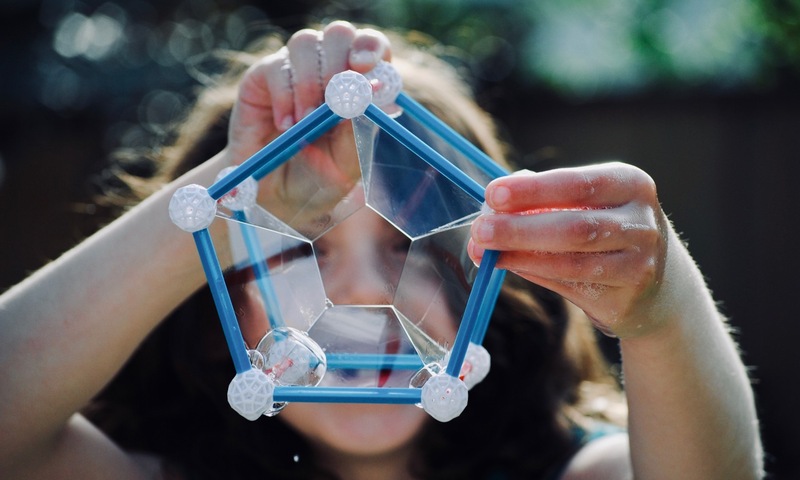 Students could increase the length of the prism or the size of the triangle base. Which has the greater effect? Also, there’s something interesting happening here with the sum of consecutive odd numbers. Oh yeah… a shout-out goes to Andrew Stadel for his Couch Coins task. I really like the video you present for this task. I have another question as well – how long would it take at the rate you’ve got the smaller boxes going into the larger box to fill up the larger box? It requires figuring out the question you’ve answered above, plus doing some calculations around rates. This is slick man. I’ll relax and can wait for Act 3. Ok, I’m lying, I can’t wait. I’m really looking forward to it! Thanks for the shout-out. @David Another task that is bouncing around in my head right now would probably benefit from this rate/time approach. I may have to learn how to add a timer and speed up the video to make that part work. @Andrew Thanks. Your couch coins task as well as Chris Robinson’s function machine on visualpatterns.org have motivated me to see what I can create using stop motion/Keynote. I know, I know. I ran into a couple of problems with the reveal. That regular sized Toblerone cost me $2. I imagined showing seven triangular prisms made up of nine marching into the large box. I think students would feel cheated if I just looped as above. $126 is a little too rich for me. I’ve got to think about a workaround. Hi Chris Am I missing something? 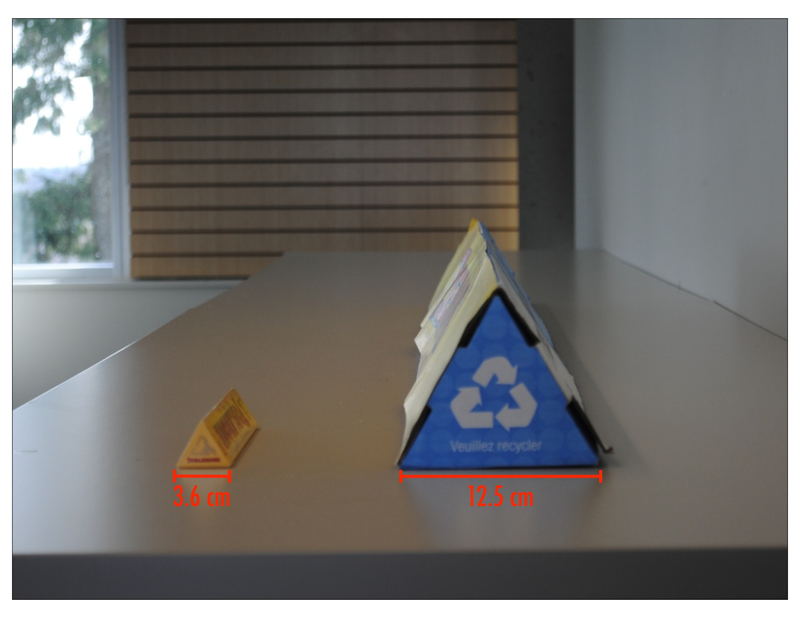 Don’t I need the height of the triangular base? It’s an equilateral triangle, so no? 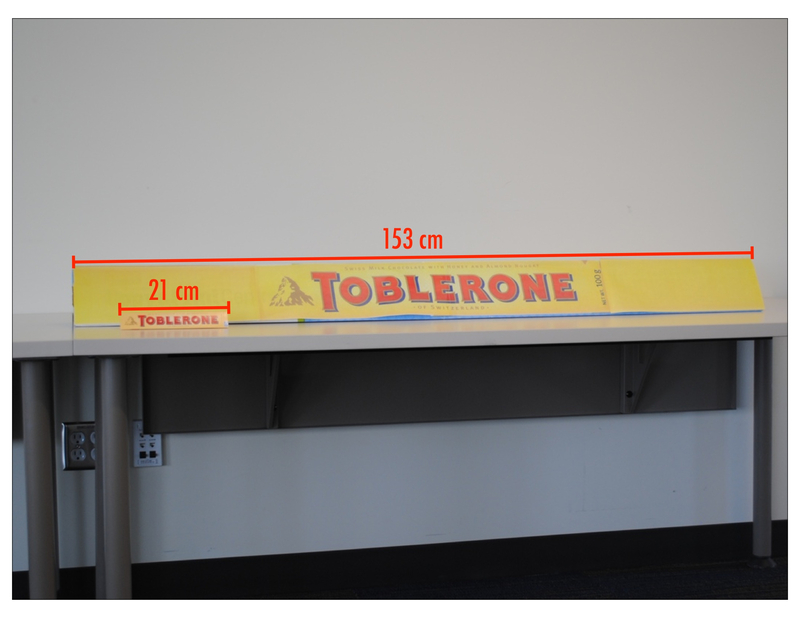 Nine regular-sized Toblerone bars can be arranged in a stack, like here: https://i2.wp.com/reflectionsinthewhy.files.wordpress.com/2018/04/toblerone-stack-001.jpeg?ssl=1&w=450 The side lengths of these add to 10.8 cm, a little less than the side lengths of 12.5 cm of the large box.